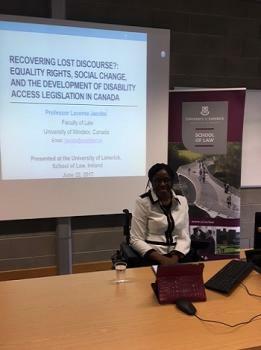 On Thursday evening the School of Law was delighted to welcome guest speaker Professor Laverne Jacobs from the University of Windsor, Canada. Professor Jacobs delivered a thought-provoking paper entitled "Recovering Lost Discourse? : Equality Rights, Social Change and the Development of Disability Access Legislation in Canada". The event was organised by Dr Margaret Fitzgerald O'Reilly with the help of Josephine Conway.